Always a family favorite, how many of you out there have played Hasbro’s “Bop-It” Game? It’s a toy that you either have to Bop, Twist, or Turn when the contraption instructs you to so. It literally talks to you and gets progressively faster the longer you play without messing up. Not an easy game but addictive. When I heard this week’s IF topic “twist”, this is the first thing I thought about. What a colorful and fun character!! Love it! Ha ha…great one, Vern! I love the expression on his face! Oh, so clever! 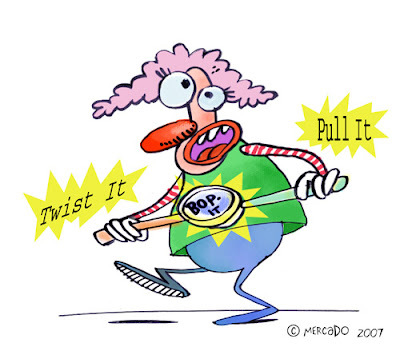 I, personally, am terrible at those Bop-It things…I wish the clown luck :). I’ve never played it, but I remember the commercials on TV were kind of annoying. But I love your illustration of it, I would have rather seen an animation of your clown on the commercials!! Too funny! Love that Bop-it game – very addicting! !